Normally, the closest I’ll get to white workwear outfits is a white shirt. Or super-clean white trainers perhaps. It just seems a bit too dressy to go full-on white sometimes, I don’t know why that is but I always associate white with occasionwear, days at the races and holidays on the beach right? Another big issues with white is that it’s gotta be spotless and perfectly pressed (ie basically impossible and/or a big hassle). 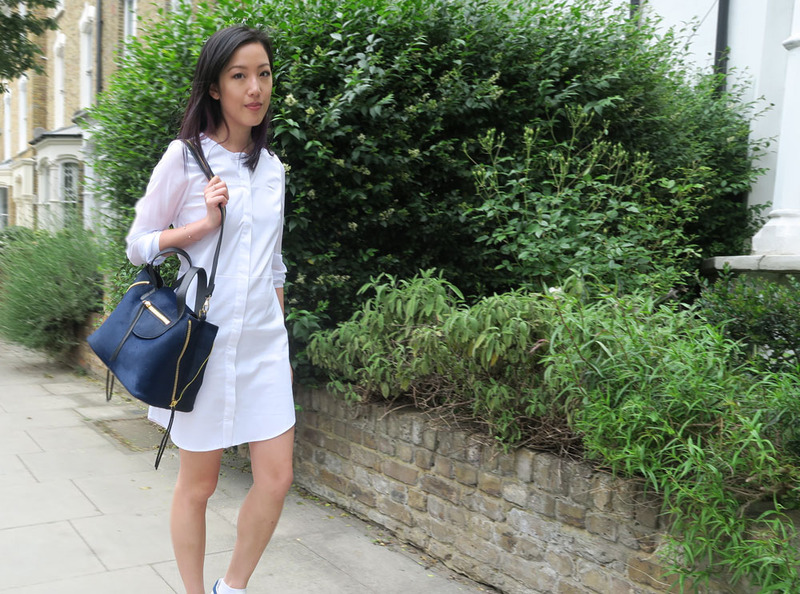 However there’s one thing that changes how I feel about white workwear outfits and that’s a hefty dose of sunshine. So I bought this white Lansdell shirt dress as part of the Finery London sale but I just haven’t had a chance to wear it. I’m a big fan of Finery – created by two ex ASOS and Topshop directors, it’s basically like a fashion forward COS – all the nice fabrics and quality but slightly edgier shapes and details. The only thing I don’t like is the postage costs – they need to sort free delivery when their normal item price is at least £30! Teamed alongside my spotless shirt dress was my NEW BABY. Sort of. So, in the absence of getting a real pet, Mr FV allowed me to get a furry handbag instead. What a compromise…. Enter my new Meli Melo utility bag. 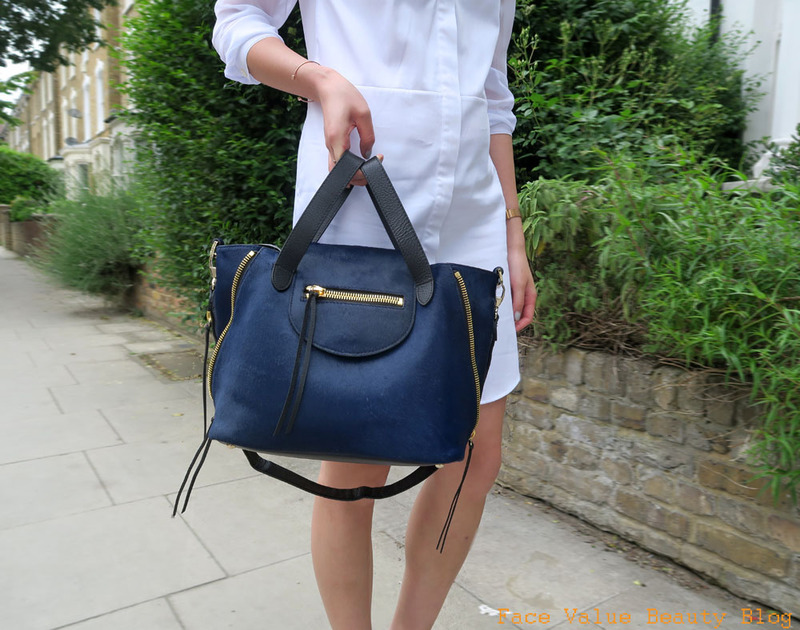 Set in Indigo ponyskin, this bag is an absolute joy. It was in the Meli Melo sale (do I ever buy anything full price these days??) The inverted handles mean you can actually tote it on your arm with the bag facing outwards, it’s a really unique design. Like all great day bags, it’s also really versatile. The zips can also be closed so that the bag becomes smaller, and there’s a longer shoulder strap if you’re the kind to sling over your shoulder rather than tote on your arm. As a show of how much I DEFINITELY wanted it, it took me about 4 attempts to buy it, including going to the Meli Melo boutique in Portobello Road (also known as the FURTHEST place away from me to get to) – but they didn’t have it, so they ordered it in and I attempted to go twice more before I actually had it in my grasping little arms. And finally, the shoes! Since I work in a startup – the obligatory trainers rather than heels. Partly for walking to work, and partly out of laziness. All my old corporate heels are quietly sobbing in the back of the closet somewhere because I’ve worn this pair of Stan Smith lookalike trainers from New Look almost every day for the last 2 weeks. It’s funny because I never really wore trainers regularly before except for some obnoxious high tops every now and then, but now I am a white trainer convert! Not so much that I would spend £70 on what is basically the worlds most hyped and worn trainer, but instead I plumped for these New Look lookalikes, for a steal at £10 from Depop. 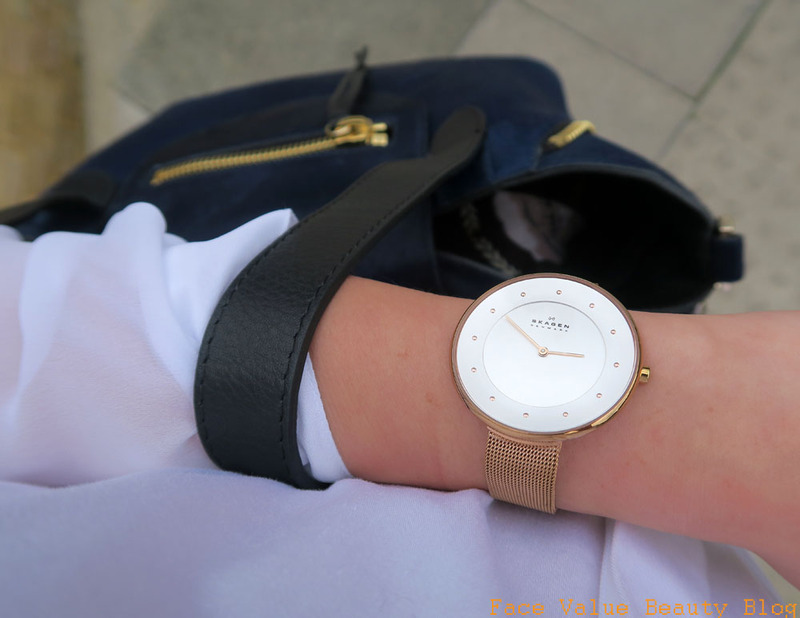 Teamed with my favourite rose gold Skagen watch, a touch of metal hardware adds a bit of an edge to a girly outfit. This rose gold version from ASOS is also great but it’s a bit too similar to my own to justify getting another one…… right? Now, if only the weather stayed like this all the time eh? Hope you’re all enjoying this brief spot of good weather! What do YOU think? Is white just for good weather days? How do you keep it perfect? Tweet me your thoughts @FaceValueBlog or send me a comment on Facebook!